Forest City Fashionista: "Don't Be a Hater, Dear"
Myrtle's fab cat eye glasses, flaming orange hair, love of bold patterns and colours, and couture obssession earned her a place in my list of television character style icons. It was not only Myrtle's eccentric style, but also her dry wit and irresistibly quotable dialogue that held my attention. The episode in which she plays the Theremin (of course she would) and advises one of the other characters, "don't be a hater, dear" spawned a spate of gifs like the one above. I don't know whether the eyeglasses that Myrtle wears in the show are vintage or new, but I lusted after every pair. ....and the GLOVES, OMG, the GLOVES!!! Rest in Peace, Myrtle Snow. You were the MOST. AWESOME. WITCH. EVER. I don't know this show. Why? I am certainly a fan now of Myrtle, better late than never. You nailed it, gloves and eyewear as part of an overall package. I wish there was a company that sold vintage-looking frames at big box discounts. I'd buy a new pair regularly. You said it - Ba-bye, January. 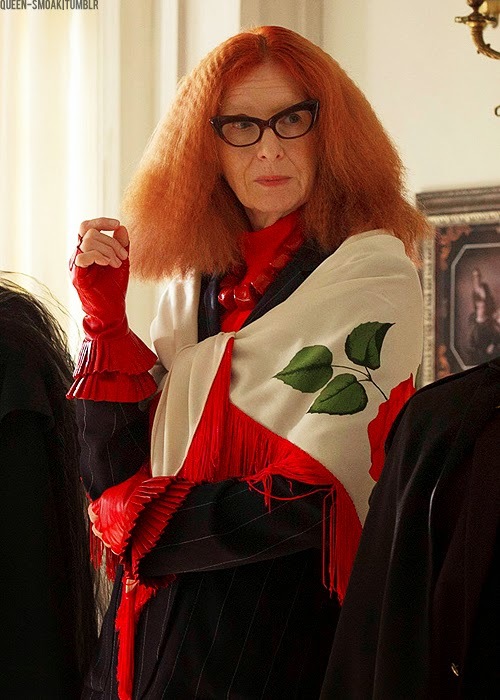 I think the Grace Coddington hair was deliberate, given Myrtle's obsession with couture clothing and if you look at a photo of Grace, the resemblance is pretty striking. Oh, I was so annoyed with this show (especially the final episode), but there parts that I LOVED and Myrtle was one of them. Gawd, I adored her. I would like to be her when I grow up! Balenciaga! 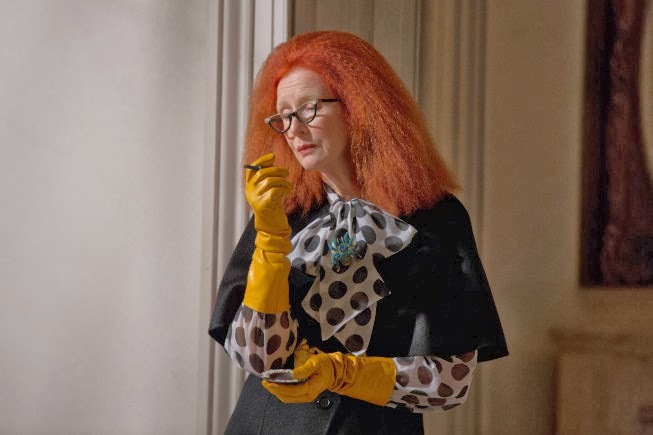 Since Myrtle is so tuned into fashion, I assumed she was a compilation and homage to Grace Coddington of Vogue (a la the wild, flaming red hair) and Carmel Snow (via her surname), who worked with Diana Vreeland when both were at Bazaar. Diana went on to be editor at Vogue & Carmel became editor at Bazaar. 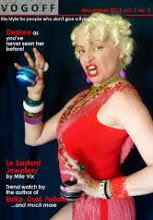 Myrtle spouts hilarious bon mots. While DV was well-known for her pronouncements, Carmel Snow was no slouch. One of my favorite Snow quotes: "Elegance is just taste plus a dose of daring"! Myrtle's red fingerless gauntlet gloves with the pleated ruffle had me at "hello". And Valerie chimes in: OMG! 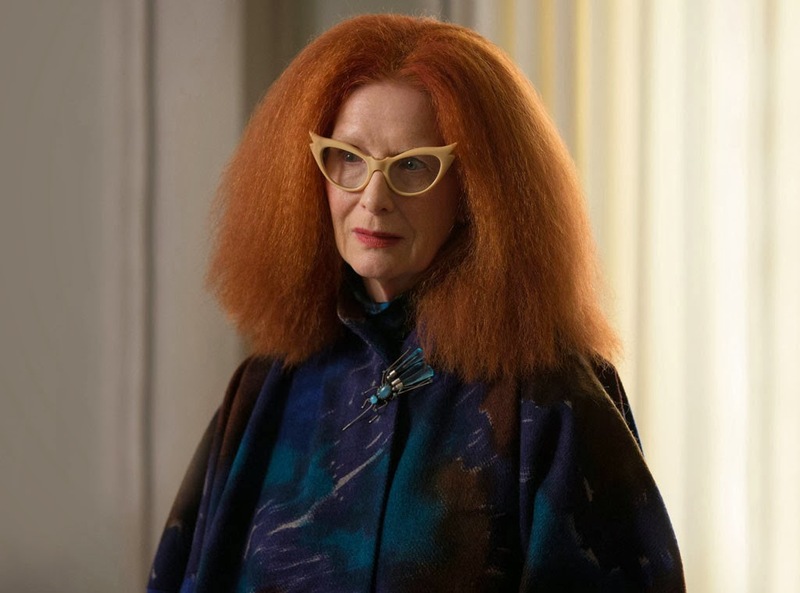 This is the same Frances Conroy from Six Feet Under!!! (Mother to the man who went on to play Dexter. Hmmm.... Are we seeing a pattern here?) Who would have known she was soooo versatile?! This has got to be the kind of role a woman would kill for. What fun you could have with this - and she clearly IS. Doesn't this beat hell out of playing someone's patient grandma? Like Curtise, these shows pass me by. No HBO or cable for me, so I've never seen Mad Men or Breaking Bad or American Horror Story. You've got me intrigued, though - Myrtle looks fabulous! Never seen this show but she lookes fab ! And her last words..
Another boring old terrestrial TV owner here, I'm, as always, woefully behind the times. Another wonderfully creative post my dear! You were able to pull this character succinctly from the drama … and what an inspirationally chic character she is! 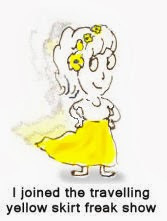 I also was thinking Grace … loved Jean's background info on Carmel Snow! Oh goodness I have yet to see this season but so enjoyed the last one. This character looks amazing in that she doesn't look like a typical witch. I have a soft spot for any and all gingers, her hair is EPIC! I can't wait now even more to watch it! I can see why you dig her Shelley and I think she looks to be a fabulous place for inspiration! OMG!!! I have heard of this show, but never seen it and now I MUST!!!! Myrtle is AMAZING!!! And o YES, those GLOVES!!!! To die for! 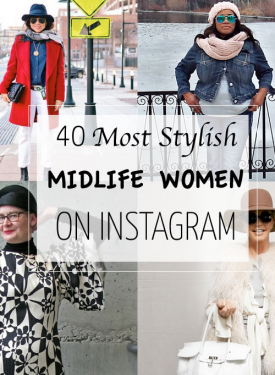 I'm coveting that fringed shawl!, I'm coveting everything! ha ha! I had no idea what she had screamed as her last words. That is hilarious. Thanks for clearing that up. I hated this season of the show, but like you, thought her fashion and dialogue was inspired. Jessica Lange as always was brilliant despite the horrible writing.